Helen Keller, blind and deaf from infancy, wrote in the Readers' Digest 70 years ago: "Recently I asked a friend, who had just returned from a long walk in the woods, what she had observed. 'Nothing in particular,' she replied. "How was it possible, I asked myself, to walk for an hour through the woods and see nothing worthy of note? I who cannot see find hundreds of things to interest me through mere touch. I feel the delicate symmetry of a leaf, I pass my hands lovingly about the smooth skin of a silver birch, or the rough, shaggy bark of a pine. In spring I touch the branches of trees hopefully in search of a bud, the first sign of awakening Nature after her winter's sleep." I was reminded of this essay that the Readers' Digest republished recently when a few days ago I witnessed a group of visually impaired schoolchildren touch and smell virtually each and every leaf and flower with great enthusiasm and excitement in a garden built exclusively for them by the M S Swaminathan Research Foundation. But the moment the children crossed the gate and entered the garden, there was a metamorphosis. They were carefree and full of life, shouting, laughing, running around the garden with cheerful abandon, like any other children would. It was quite evident that they felt at home and were not intimidated by the ambience. It is believed that a third of the world's blind population is in India and there are an estimated 10 million visually impaired people in this country. Out of the 10 million, at least a third are children. 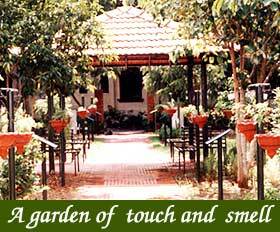 It is to make the lives of the visually impaired children fuller and to help them experience the joy of nature and learn through exploration using the senses of touch and smell that the MSSRF has created the 'Touch and Smell Garden'. Dr Swaminathan's vision was to have a program with the aim to unravel the scientist in every child. "The objective is to empower children of marginalised groups in both rural and urban areas with knowledge relating to biodiversity and environment, with the help of information technology," said Dr Rajalakshmy, scientist-in-charge of the garden. A Braille board at the entrance explains the topography of the garden including instructions for children to walk around without any help. Another Braille board describes the garden. To facilitate easier movement of the children, the garden is divided into four identical blocks, and the blocks are accessible by footpaths lined with chequered tiles. In each block, soft, smaller sized pebbles have been laid to indicate the presence of Braille boards on the side of the path. These Braille boards, written in Tamil, tell them the botanical, English, and local names of the plants and a little information about the plants which are kept in the pots. Once the plant grows bigger, it is planted on the earth, and another smaller plant takes its place in the pot. "Initially we had to clear idea about designing a garden for the visually challenged. It was the children who gave us all the suggestions," said Raman, the garden manager. The students I saw there were not new to the garden as was evident from the way they moved around. "We tell our teacher to bring us here every day," said Thangavelu, after reading the Braille board for the "hundredth time". He then turned to Dr Rajalakshmy and asked, "Madam, have you not added anything new today? I want to know about more plants. I know all this by heart." Said Rajalakshmy, "Most of the students are through with what we have displayed already. That's why they are pestering me to add new plants. Their thirst for knowledge is amazing. They are not satisfied with the boards that we have provided. They want more boards and more information as they remember each and every word of what they read. One boy became so enthusiastic that he told me that he wanted to be a botanist and discover new plants." The garden has two types of plants, one of which can be recognized by touch and the other by its smell. At present, the garden has forty beds and 54 hanging pots. Some of the enthusiastic students are asking for a pond and some water plants as they have not yet felt a lotus. When I met them, the children were so excited that all of them wanted to tell me what an amazing experience it was to read about plants and then feel them. Raja, a seventh standard student at the St Louis Blind School, was initially surprised to hear about such a garden. "I couldn't believe that somebody had built a garden for us. We are all so grateful to Dr Swaminathan for this gesture. Just imagine, if not for this garden, how would we have learnt about these plants? It is only now that I have developed an interest in science. I feel like coming here everyday to touch these plants." Shakthi Kumaran, a ninth standard student remembered how scared and sceptical he was the first time he came to the garden but the fear vanished the next time. He now wants to enjoy the world of plants everyday. He said, "You people see plants and touch the leaves and flowers everyday but I never had a chance to feel and know a plant till I came here. I used to ask my parents about the plants that we have in our backyard but nobody was interested in telling me anything. They would say, 'What do you know about plants? You can't see anything.' How differently we are treated here! We do not have to ask anyone as all the details are written here on Braille. Whatever we ask for, they bring it here. I feel so happy coming here..."
Even before visiting the garden, Hidayathullah's dream has always been to be a scientist. He is very grateful for this facility for s blind children. "Till now, nobody cared to tell us all these details about plants," he said. Tamil Nadu Chief Minister J Jayalalithaa, who inaugurated the garden, was so enamoured by the garden and the enthusiasm of the blind students that she donated Rs 500,000 for the project and has promised to start such gardens in other parts of the state.